I dont bother to grab some rite now, very tempting fritters.. I am always tempted to have them but seriously cant handle the heat. looks awesome. yummy n cute looking bhajji...feel like having some of it now,.. I use almost similar filling for the bajji. Come times I use lime juice instead of tamarind juice. 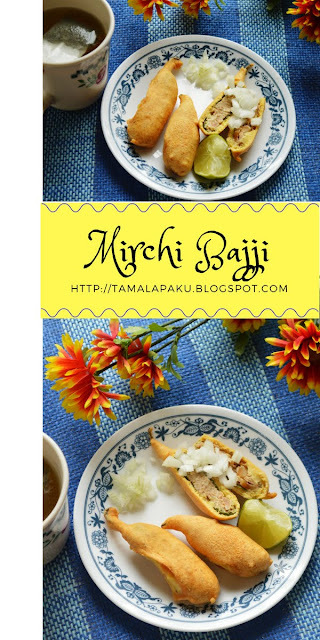 Yes, mirchi bajji is loved almost everyone and I am one of them. Delicious bajjis Harini. Whenever we go for exhibition, we never miss to have these bajjis, but we get the ones that are milder. Not these peppers though. I am always amazed at anyone who can eat mirchi bhajis. They look so good and I know my husband would love this. These bhajjis are my favourite.but I have never made this version , I always stuff them with potatoes . The use of tamarind is awesome , need to try these asap . Btw I saw these on the streets of Pondy ,but the bhajji had eggs ..
We love this snack Harini, Athamma makes it with different stuffings and each one tastes better than the other..your clicks look awesome! Perfect bajji to munch with some hot tea. You have made them so well , so absolutely delicious. How tempting and catchy those hot pepper fritters looks, my mouth is watering here. Awesome clicks there. So tempting, wish I could have a few right now. I usually stuff them with potatoes, but would love to try out your filling. It is a favourite of ,y husband’s though I can’t imagine eating something so spicy....yours have turned out golden brown and so tempting! wow this looks so good....we usually just use besan.... ur bajji is fit for a king! Mirchi bhajji is my favorite tea time snack and your stuffing makes it more inviting. Delicious!! The Mirchi makes a lot of difference. Wish can have some.